Subaru hit a huge milestone in Australia by selling a new 2014 Subaru Forester XT Premium which makes it the 700,000 Subaru sold in the country down under. It took Subaru Australia 15 years to sell its first 100,000 vehicles, and the last 100,000 have been sold in just 31 months. Subaru has been selling their all-wheel-drive vehicles in Australia for 40 years, and a new 2014 Forester XT Premium has set a major milestone last week when it was delivered to its new owner in Sidney. Subaru Australia has announced that the sale of this new-generation Forester XT Premium represents the 700,000th vehicle in its 40th year of Subaru sales in Australia. That’s quite an achievement for the Japanese automaker. Australia is one of four top markets for Subaru and the milestone shows just how strong a market it is. Of course a significant number have been all-wheel-drive, which is ideal for the Australian consumer. But the rear-drive sporty 2013 Subaru BRZ has also been a strong seller down under. But it looks like the new Forester will remain a top seller for Subaru. The vast majority of Subaru sales are split between its Sports Utility Vehicle range, comprising Forester, Outback and Tribeca, and its passenger car range, with Impreza and Liberty. The Forester is the top seller at 172,629 units, Impreza 153,000, Liberty has sold 137,260, up to the end of January this year, Outback 81,167 and Tribeca 8053; a massive 562,806 units between them. Nick Senior, Managing Director, Subaru Australia. "A significant number of those cars have been All-Wheel Drive, which has been widely accepted in Australia for its safety and fun driving benefits. Of course, more recently the rear-wheel drive Subaru BRZ sports coupe has been a winner for Subaru too. Whatever the technology, Australians love the durability, safety, engineering and retained value of Subaru's. ", said Senior. The 2014 Subaru Forester 2.0XT Premium takes SUV luxury, safety and capability to a whole new level for Australian buyers. The high performance direct injection turbocharged Boxer engine produces 177kW of power (237hp) and gives its owners sharp responsiveness. The Forester 2.0XT Premium comes standard with state of the art Subaru EyeSight ‘driver assist system’, X-Mode for a “go-anywhere” attitude and keyless entry with push button start. It also features Subaru’s legendary Symmetrical All-Wheel Drive system, Lineartronic CVT and the three-mode Subaru Intelligent Drive system. The new Forester will go anywhere in Australia on-or-off-road and its been tested in extreme conditions to prove it. In Australia, Subaru posted record high sales of 40,189 units in 2012 (up 18.2% from previous year) and is poised to make another all-time record with 42,000 units in 2013. 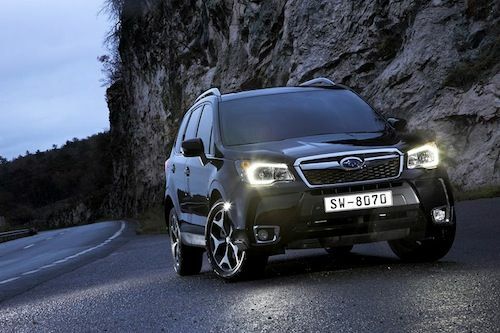 The new-generation 2014 Subaru Forester is expected to be at the top of the sales charts again for 2013.